SEATTLE – Walking down almost any street in Seattle’s historic downtown, Eric Holdeman sees danger. Holdeman ran the King County Office of Emergency Management for 11 years. He doesn’t think the area around Pioneer Square would do well in a powerful earthquake. For Holdeman, geologists and emergency planners, it’s not a question of if a major earthquake will strike the Pacific Northwest, but when. The Cascadia subduction zone, a 700-mile geological fault off America’s Northwest coast, has produced a magnitude 9.0 earthquake every 300 to 500 years. It’s been 315 years since the last one. A map of the Cascadia subduction zone. “Certainly, we’re back in that window,” Holdeman said. As regional director for the Federal Emergency Management Agency (FEMA), Kenneth Murphy would head the federal response to a Cascadia subduction zone disaster. He told America Tonight a magnitude 9.0 Cascadia subduction zone earthquake and tsunami would result in thousands of deaths and millions of homeless. “I think people are just not mentally or physically prepared to think about how bad something like that can be,” Murphy said. In Seattle, Holdeman said government officials have done little to mitigate the risks posed by old brick buildings. The city has about 800 unreinforced masonry buildings, he said. “The Cascadia subduction zone earthquake is supposed to be about a 9.0, maybe 9.1 earthquake, which is going to rock and roll everything around here for three to five minutes,” said Wallace, the deputy director of Emergency Management for Grays Harbor County. He said the violent shaking would collapse bridges and overpasses, crack roadways and pipes and cause sandy soil to lose its strength in an otherworldly process called liquefaction. Still, it’s what comes after the earthquake —a tsunami — that worries Wallace most. Walking to the top of Westport’s three-story beachfront observation tower, Wallace pointed out why tsunamis are so dangerous along the Washington coast. The land stretching from the ocean is flat, and the key to surviving a tsunami is reaching high ground. “The problem that they have here in Westport is that there is no real high ground,” said Wallace, adding that the concrete observation tower itself would not survive a tsunami. To make the situation even direr, Wallace said the earthquake would likely make the roads impassible by car, meaning people will need to walk to safety. The math is not encouraging: The first tsunami wave would make landfall in 15 to 30 minutes, yet much of Grays Harbor County is a 40- to 50-minute walk to higher ground. Geologists now fear an enormous earthquake, because the North American plate and the Juan de Fuca plate are stuck together at the Cascadia subduction zone. The North America plate wants to move west 13 feet a century above the Juan de Fuca plate, but it has been going nowhere. Every year the plates are stuck, the pressure builds. “When they suddenly get unstuck, you can get a very big earthquake,” said Brian Atwater, a geologist with the U.S. Geological Survey in Seattle. The chance of this happening in the next 50 years is 1 in 10, according to “Cascadia Subduction Zone Earthquake: A Magnitude 9.0 Earthquake Scenario,” a document produced by the FEMA and the Cascadia Region Earthquake Group. According to the report, the death toll of in a worst-case earthquake and tsunami scenario could exceed 10,000, with more than 30,000 injured. It would also have an economic impact of $70 billion across California, Oregon and Washington. I don't think this state is going to take seismic safety to an appropriate manner until we're dragging dead bodies out of buildings. Unfortunately, it's the American way that we don't address issues until we've been impacted by whatever that disaster is. Most at risk are communities along the coast. “They’ll be tremendous, very bad effects on the coastal communities,” said Murphy, FEMA’s regional director. Some 94,872 residents and 42,424 employees in Northern California, Oregon and Washington live and work in the tsunami hazard zone, according to a March study from the Proceedings of the National Academy of Sciences. One reason geologists and emergency planners are so concerned is because researchers have dug up — sometimes literally —clues that indicate the Cascadia subduction zone has generated massive earthquakes before, with devastating results. Ruth Ludwin began studying native legends passed down from generation to generation by tribes all along the coast. One fascinated her in particular: the legend of the thunderbird and the whale. In the story, the thunderbird battles a killer whale, carrying it high in the air before dropping it. The thunderbird and the whale at the American Natural History Museum. “The real key for me was the person telling me the story told me that at the time the thunderbird fought the whale, there was a jumping up and a shaking of the earth and a rolling up of the great waters,” said Ludwin, a retired research seismologist at the University of Washington. To Ludwin, the story sounded a lot like an earthquake and tsunami, but because the story was part of an oral tradition, it was hard to pin down when the event might have occurred. The stories dated from a time when the Pacific Northwest was a great unknown to European mapmakers – undiscovered, uncharted and unexplored. Since the 1980s, though, scientists have gathered a growing body of evidence of a powerful earthquake and tsunami three centuries ago in the sediment along the coast of Washington, proving the tale of the thunderbird and the whale was more than colorful legend. Long dead western red cedars – dubbed “ghost trees” – provide the most compelling proof. Scientists say they died when the ground subsided in an earthquake and salt water infiltrated their roots. By comparing the rings of ghost trees to ancient trees felled recently, the geological detectives have determined their time of death as January 1700. The limbless gray trees still jutting from the marshes serve as monuments to the long ago event – and a warning of the coming cataclysm. The challenge for FEMA's Kenneth Murphy and other responders is daunting. With the current understanding of the risk posed by a Cascadia subduction zone earthquake, Murphy and emergency planners said residents of the Pacific Northwest should prepare for a worst-case scenario, living for a week or more without Internet, cellphone service, electricity, drinking water and a working sewage system. He described a nightmarish scenario of ruptured gas lines creating fires, broken water lines causing flooding, impassible highways and a lack of communication. “I think you'll see a lot of…islands of communities, groups of people that are isolated, maybe hard to get to,” Murphy said. The challenge for FEMA and other responders is also daunting. “You've got to bring food, water, lifesaving supplies, medical, search and rescue, all those different things, literally to two relatively large states,” Murphy said. Washington’s Department of Transportation created an animation showing the devastation a 7.0 magnitude earthquake near Seattle might cause to the highways connecting the city with the rest of the world. A magnitude 9.0 earthquake would be 100 times more powerful. One group with firsthand experience of the devastating power of the Cascadia subduction zone is the Huu-ay-aht First Nation on Vancouver Island, British Columbia. Huu-ay-aht tribal leader Robert Dennis wants to prepare his people for a potentially severe earthquake and tsunami. The tribe was living along the water when the last tsunami struck in 1700, killing 400 or 500 members, according to tribal leader Robert Dennis. He heard the story from his grandfather, Chief Louie Nookmiis, not long before his death in 1964. Based on the tribe’s oral tradition and the latest science, Dennis said the Huu-ay-aht is urging tribal members to build on the hill above the traditional village along the water. As superintendent of the Ocosta School District in Grays Harbor County, Paula Akerlund also takes the tsunami risks seriously. The school district is less than a mile from the Pacific Ocean and 50 miles from the Cascadia subduction zone. 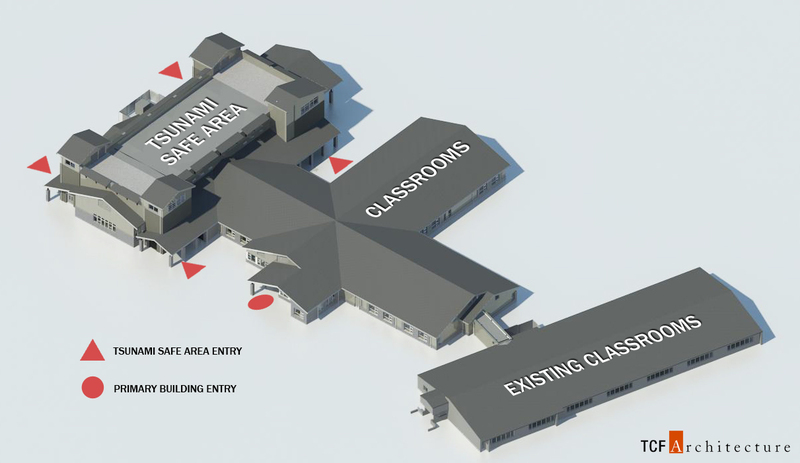 When the school district needed a new elementary school, Akerlund decided to push for something more – a school that would double as a safe haven in a tsunami. In 2013, voters agreed to a $13.8 million bond issue, about 20 percent more than they would have paid or a standard elementary school. This was done, she says, so the roof of the elementary school gym could double as a refuge for the district’s 700 students, as well as teachers and other staff. When it’s completed next spring, Akerlund said it will be the first vertical tsunami refuge in the United States. The building is an engineering marvel, designed to withstand a magnitude 9.0 earthquake, followed by the ground sinking as much as six feet, and then a tsunami wave that could top 30 feet. The roof would be stocked with food and water for 10 days, Akerlund said. Are Texas developers suffering from ‘flood amnesia’? Will historic flooding in Texas curb the state's building boom?